A leading player in mobile app acceleration Twin Prime has released the “State of Mobile Performance report”, providing a detailed analysis on the current state of mobile performance in the U.S., Europe, and India. According to the report, Airtel is found to be the fastest carrier in India. Reliance Jio, on the other hand, is ranked high for its consistency. The report has looked into various parameters to rank the carriers. One parameter considered is the performance in terms of speed while downloading media; second is the performance variability between the fastest and the average user; third is the quality of network in terms of network response time; and fourth is the LTE coverage as measured by the likelihood that an LTE user will access an LTE network when using an app. In the analysis, Airtel topped the ranking in performance across 2G, 3G, HSPA, and LTE showing the highest quality network. Reliance Jio reported a slightly slower performance than Airtel but provides a uniform experience to its users with its consistency. Reliance Jio also ranked first in the coverage metric, which is somewhat expected given that it is a 4G/LTE only network. “In LTE, Airtel is 1st (15% faster than Tata Docomo) followed by Aircel and Reliance in 3rd and 4th, and BSNL and JIO in 5th and 6th. To put this performance ranking into perspective, it would take on average 222ms to download a 40KB image on LTE over Airtel,” pointed out the report. In terms of HSPA, the dominant network technology in the Indian market, Airtel measured to be 24% faster than Vodafone and 40% faster than 3rd ranked Tata DoCoMo. Hence, Airtel and Vodafone were concluded to be the best carriers in India. When it comes to 3G, Airtel and Tata Docomo showed an average of about 300ms-400ms faster when downloading a 40KB image. 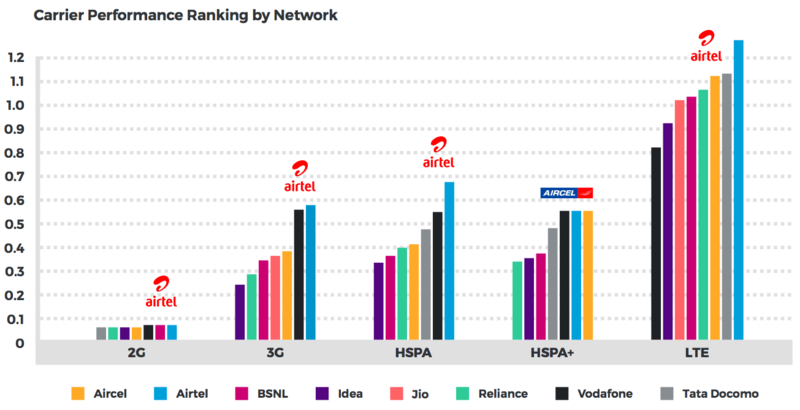 Aircel, Vodafone, and BSNL are ranked as 3rd, 4th, and 5th respectively. The comparison between HSPA and HSPA-Plus reveal that the numbers are identical, meaning the deployment of HSPA-Plus has not brought any major improvement in the speed. When measured the variability ranking, Reliance Jio has the smallest variability index at 1.6. “This means that faster Jio users experience about 60% better performance than average Jio users. The gap is bigger for Airtel, Tata Docomo, and Vodafone at 70%. Idea is the most variable carrier, with a variability index of 2.2,” report elucidated. Airtel is found to be the best in LTE and HSPA. Reliance is second in LTE with 17ms, BSNL is third with 21ms slower response times. It takes devices about 100ms to access a network. In HSPA, Airtel tops the charts with 107ms, Tata Docomo comes second with 113ms, and Reliance is third with 125ms. For 3G, the top network response times are in the 115ms range and the slower networks are in the 210-240ms range. To say, Vodafone has a fairly high response time of 213ms. The LTE coverage of Jio’s network is found to be 98%. Idea followed Jio with a coverage of 25%. Airtel registered 23% coverage and Vodafone was the least with 11%. The report also has more interesting comparisons between Wi-Fi and LTE performances, comparison between cities, and also, the information about the status in Europe and India. Yeah maga. Nagarabaavi, MallathaLLi, and all those sides have low JIO speeds.